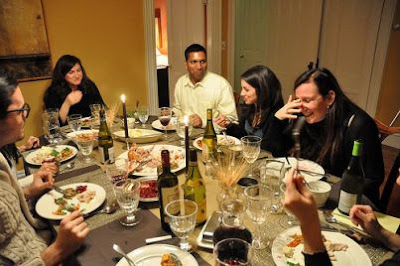 Authentic Light: Thanksgiving -- Ancient Israelite Style! Thanksgiving -- Ancient Israelite Style! To thank the Lord for his many blessings many of us gather together with our families at this time of year. We bring our best food, lots of meat and baked goods made from scratch with the best ingredients. Then we offer a prayer of thanks, recounting what we are grateful for. After that we spend the day eating, talking, and laughing, enjoying each other's company -- and God's blessing. We don't have to do this, but it's a tradition and we always look forward to it. No, I'm not bragging about the Thanksgiving my extended family is having today. This is thanksgiving the way that ancient Israelites did it, 3000+ years ago. If someone offers a sacrifice out of thanksgiving, then in addition to the sacrifice he must offer loaves of unleavened bread mixed with oil, unleavened wafers topped with oil, and loaves of the finest flour mixed with oil. Along with the peace offerings for thanksgiving, a person must include loaves of leavened bread. He must present one of each kind of bread as a gift to Me; it will belong to the priest who officiates the sacrifice and splatters the blood of the peace offerings against the sides of the altar. There are obvious differences of course and the last thing I'm trying to do is suggest that Americans are modern Israelites (although the Puritans, who started our Thanksgiving tradition, are just the kind of guys who would read Leviticus). But it is interesting to me that there is a more than passing similarity between their thanksgiving and our thanksgiving. In this book God is setting up a way for Israel to relate to their God. As part of that he includes a way to spontaneously say "thank you" to him when they are so moved. Most of the other sacrifices ordained in the first 7 chapters of Leviticus are either completely consumed in the altar fire or part is set aside for the Priests. But when it comes to thanksgiving, God's idea is: Get your family together, bring your best animal (which is what a sacrifice had to be), make 3 kinds of baked goods, and then gather before me (at the 'congregation tent' -- the forerunner of Solomon's Temple) and we'll have a good time together. And eat all you want because there won't be any leftovers. Throughout the Scriptures we find God working through community and food. He is not an austere, far-off deity or the kind who does everything himself. God is constantly, intimately involved with every mundane thing in his people's lives, working through them to fulfill his eternal purposes. Even the most profound, sacred thing we do as the Christian movement, taking Holy Communion, is God working through food to transform his people and through them the world. That's a good reason to be thankful. And it's a good reason to give thanks in this ancient way that also seems so natural to us.